Circulation of this Overview Document is unrestricted. Other documents may supersede this document. This document provides the translation of the standard and documentation labels in the XBRL Global Ledger Taxonomy Framework 2015 in the following languages: Brazilian Portuguese, Chinese, Italian, Spanish, Finnish (partial), Canadian French (partial), Turkish (partial). 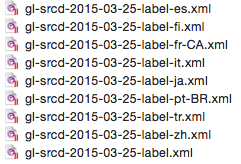 1 Label linkbases in the "srcd" module folder. The XBRL Global Ledger Taxonomy Framework 2015 [XBRL-GL-2015] reached RECOMMENDATION status in 2015, and it is the result of years of implementation experience since the previous RECOMMENDATION in 2007 and its older releases. Due to its nature of generic and holistic representation of business, accounting and financial information as found in software applications and data repositories used within any organization, these implementations took place in multiple jurisdictions. This over time determined the need for labels and documentation in different languages, in addition to English and Japanese that are already supported in XBRL GL 2015. This document provides complete sets of labels and documentation in several languages, as well as partial sets that have been published in some countries and that correspond to the subset of XBRL GL elements currently used in those countries. Note that the Language Code provided conforms to the Best Current Practice (BCP) 47 [BCP47] published by the Internet Engineering Task Force (IETF). This section describes the additional files provided as part of this release to support the languages listed in Section 2, and their location within the folder structure of XBRL GL 2015. A full version of XBRL GL 2015 including these additional files can be downloaded from http://www.xbrl.org/int/gl/2015-06-10/XBRL-GL-REC-2015-03-25+lang-2015-06-10.zip. For a complete explanation of the architecture of XBRL GL 2015 [XBRL-GL-2015] and of the organization of entry points, schemas and label linkbases please refer to XBRL GL Taxonomy Framework Technical Architecture [GLTFTA-2015]. Each module folder – “bus”, “cor”, “muc”, “srcd”, “taf” and “usk” – contains a “lang” folder. In this folder there is one label linkbase for each language supported. The name of each linkbase follows the pattern “gl-[mod]-2015-01-21-label-[language].xml” where [mod] is the module folder name and [language] is the BCP 47 language code, including the region where appropriate. Only the English linkbase file name does not include the language code. Figure 1: Label linkbases in the "srcd" module folder. Each folder in the “plt” folder – the “palette” folder - contains a combination of XBRL GL modules. Each of these sub-folders contains the entry point “gl-plt-all-2015-01-21.xsd” that references all the available sets of standard labels and documentation labels. In addition, each folder contains one entry point for each individual set of standard and documentation labels. IETF. "Tags for Identifying Languages"
A. Phillips, and M. Davis. XBRL International Inc.. "XBRL GL Taxonomy Framework Technical Architecture 2015"
XBRL International Inc.. "XBRL Global Ledger 2015 Framework"
Eric E. Cohen, Gianluca Garbellotto, and Masatomo Goto. Canadian French: Services linguistiques de CPA Canada. Chinese: XinQuan Jia, GL Consulting Co., Ltd.